Weather in Michigan is always changing. This past weekend it was sunny, beautiful and the thermometer hit 60 degrees. But then a weather system moved in and dumped about a foot of snow on us. Yikes!!! So what to do on an unexpected snow day? Play outside of course! 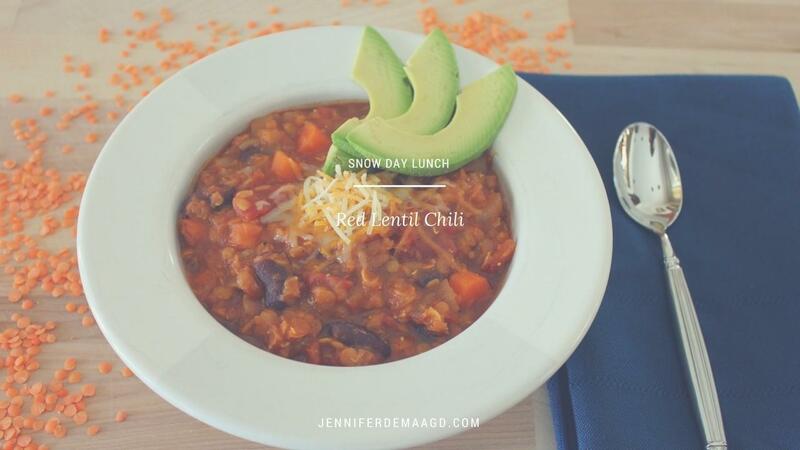 And make some chili for lunch….. This chili is the ultimate comfort food. Warm, nourishing, packed with fiber and protein. Add onions, celery, carrots, garlic and 1 cup of the vegetable broth to large pot and saute on medium high for 7 -8 minutes, until vegetables start to soften. Add lentils, tomatoes, kidney beans, and the rest of the vegetable broth to pot, bring to a boil, and then cover and simmer on low for about 45 minutes, until the lentils are soft. Make sure to stir periodically. I’m a wimp when it comes to spicy food. If you like your chili “Hot”, feel free to add cayenne pepper to taste. I like to top my chili with some cheddar cheese and avocado. Feel free to add whatever toppings you love.